Himpunan Mahasiswa Pascajarna (HMP, graduate student association) Faculty of Animal Science UGM organizd English Course program to improve students’ capacity communicating in English. 20 students joined the program that was held since October 19th, 2018 until the end of the semester. Funded by the Graduate Program, the English Course was held twice a week. “English course has an objective to equip students with English grammar, emphasizing on writing skill. 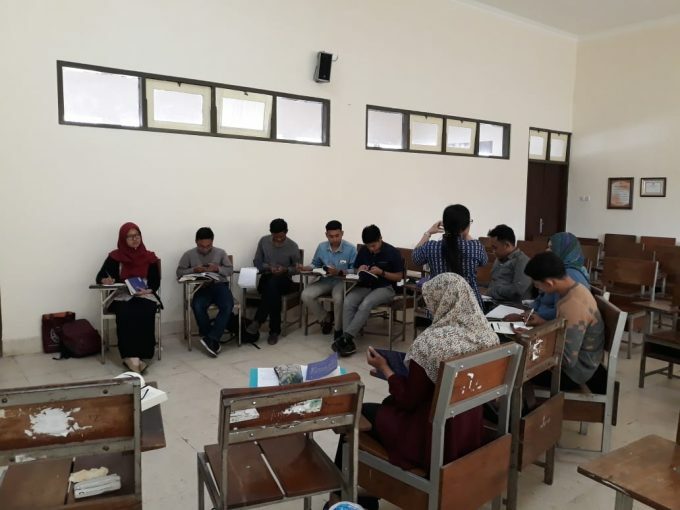 Hopefully, it will help them in academic writing, such as writing a research article which is required to graduate,” said the President of HMP FAPET UGM. An experienced English instructor taught students in the program. The instructor initiated the session with types of tenses. Students then received on explanation regarding various writing models. Since the program was organized after the lecture hours, students could actively joined the program. “After each session, the instructor always asked us to write, applying what we just learned. The instructor would then check it one by one. So, we got hands-on experience,” told Dayat, an English Course student. At the end of the program, Slamet Widodo as the President of HMP FAPET UGM hopes that HMP will be able to keep organizing activities that will benefit students. He also thanked Faculty of Animal Science for always supporting student activity.